Over the long weekend, our cats caught four moles. Moles use their front facing paws and claws to dig and eat mostly earthworms which they paralyze with a toxin in their saliva. They live their entire lives underground except when they leave the nest in early adulthood to find their own homes. It may be that these moles were searching for a new home when our cats got them. We don't generally see moles, but I'll be watching for them now. On Memorial Day, we remember and honor those brave men and women who gave the ultimate sacrifice for our nation. I imagine that when Victory Park was dedicated 56 years ago there were many in attendance who knew some of the more than 400,000 Americans who died in WW II. And certainly some of those in attendance were mothers of soldiers who did not return home. This plaque and flagpole were provided by those Gold Star Mothers. American Gold Star Mothers was formed in the aftermath of WWI by mothers whose sons or daughters died in the war. It was wartime tradition for families to hang a blue star in their window for family members serving in the Armed Forces. Families honored those who died in war by covering the blue star with a gold star. As described on the Gold Star Moms' site, the Gold Star represents the "honor and glory accorded the person for his supreme sacrifice in offering for his country the last full measure of devotion, and pride of the family in this sacrifice." Some websites to check this Memorial Day: Vietnam Veterans Memorial, National WWII Memorial, Pasadena Public Memorials and American Gold Star Mothers. Last weekend my son and I went on an overnight campout with his scout den to Gould Mesa. The campground is about a mile north of JPL in the Arroyo Seco. The weather was hot and I saw four snakes over the two day trip. 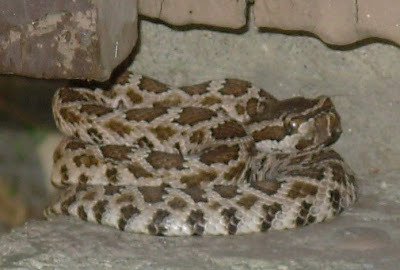 This is a rattler that was coiled in the shade of a post right outside the privy that serves the campground. The most interesting snake I saw was a striped racer snake that darted out of a bush chasing a mouse. The chase ensued down the trail until the mouse darted back into a bush and with the snake in pursuit. Watching the chase was fun, but the chaser and chasee were out of sight before I could get my camera out. The stream is across the trail from camp and was welcome relief to the weekend's 100 degree heat. Nightime was also cool with a light breeze drifting through our mostly mesh tent. Maybe the best thing about living in Pasadena how close we are to natural settings like this. 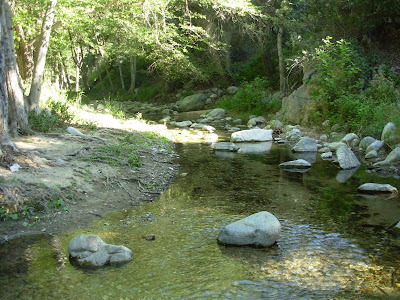 The Arroyo Seco, Millard Canyon, Eaton Canyon - we have hiked these areas over and over and it never gets old. I am always amazed at the natural beauty that is so available to us who live in the ever more urban Pasadena. 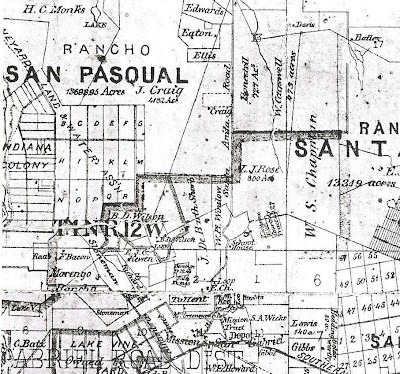 This is a portion of an 1877 map of Los Angeles County showing the early landowners of the area that was later to become eastern Pasadena. The map above also includes parts of surrounding areas. You can see the Indiana Colony to the left and San Gabriel train depot toward the bottom. The map is from L.J. Rose, Jr.’s biography of his father: L.J. Rose of Sunny Slope 1827-1899. Double click on the map to get a larger image. Some of the names of the early landowners are familiar. The names of Craig, Rose, Chapman, Eaton and Bailey all live on through namesake streets and places. Santa Anita Road is also familiar. Though not as dusty, Santa Anita Road is still in place today as Altadena Drive. 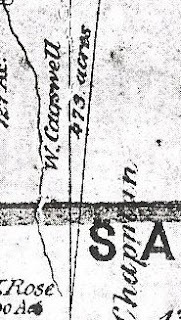 An early landowner whose name you may not recognize is that of William Cogswell, who owned the pie-shaped piece of property north of the Rose and west of the Chapman properties. 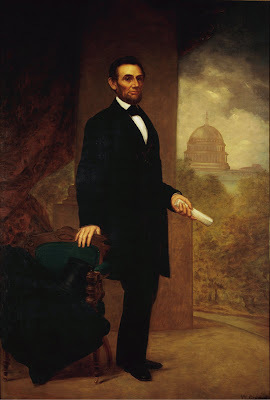 In coming posts, I’ll talk about Cogswell, how his property became world-renowned and his interesting connection to Presidents Abraham Lincoln and Ulysses. S. Grant.